A bare-bones UI belies a powerful engine – and a tool that could finally jump-start sound designers embracing an open format. Proprietary lock-in, no more. “Free As In Free Me From Proprietary Formats.” If you’re ready to explore sounds – as a novice sampler user or as an advanced sound developer – SFZ brings tidings of great joy. When they move from defining mere sounds or samples to describing whole instruments, sound designers need file formats. The problem has been that those formats tend to be particular to one sampler or another – just Kontakt, or just Logic’s EXS24, or just Gigastudio. Yes, there are converters, but because these samplers have different capabilities, converters cause problems. Being able to create instruments for these samplers is all fine and well, but sound designers badly needed a lingua franca. This all calls for some sounds, no? You’re in luck. This week, in addition to sforzando, various contributors released some 171 MB of great sounds for the engine – ready to load in sforzando. Of course, the real hope is that this kick-starts sound designers using the SFZ format. We’d love to see that happen here at CDM Tower, too, so do let us know if you go after the format. 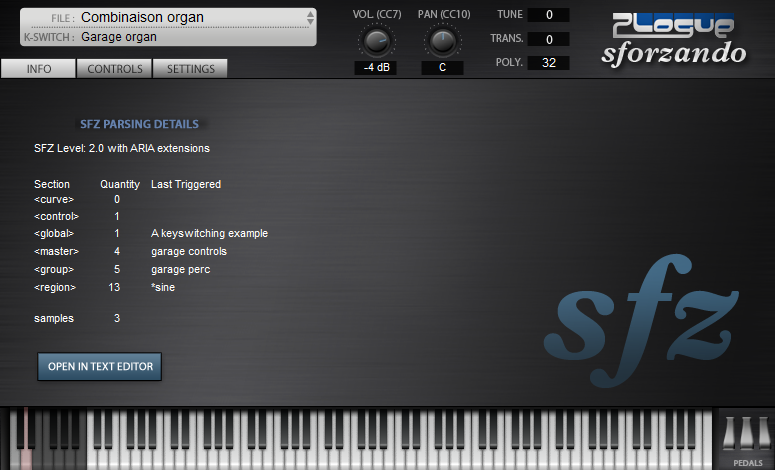 To get you started, you can drop SF2, DLS and acidized WAV files on the UI to get automatic conversion to SFZ 2.0. Drop, tweak, and publish. 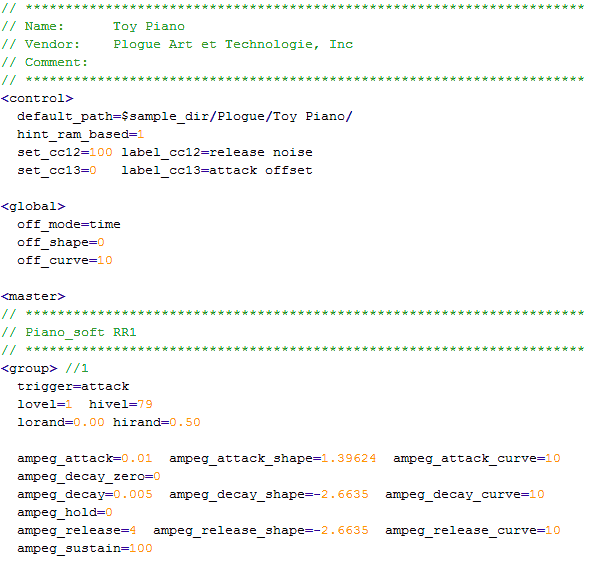 A peek inside the file format reveals a very clean, easy-to-read, logical text description of the instruments. No need to fear. Images courtesy Plogue. Back in 2005 when Gary Garritan gave me the task to design a complex sample playback engine, I obviously started with some homework. First question was obviously: “Is there already an instrument format that is open, powerful, flexible enough, and future proof”? YES! And its called SFZ!. Not only that, but I also found out it was invented by someone I both admired and respected, my old #musicdsp IRC buddy René Ceballos. The more I looked into it the more it was also obvious that René did his homework as well, since he made sure his SFZ 1.0 specification pretty much covered everything from SF2/DLS/GIG and other formats of the day. His first implementation of the format was in the famous sfz.dll plugin, originally given for free on rgcaudio.com. After being acquired by Cakewalk – and for a good while later-, René pursued the development of his specification, this time with some help from Chad Beckwith, culminating with the SFZ 2.0 format as implemented in Cakewalk Dimension™ in 2005 and in Drop Zone™ a few years later. Meanwhile at Plogue, we were just getting ready to ship the first product based on our new ARIA Engine: the Garritan Authorized Steinway Model D. Entirely SFZ based, this multi gigabyte sampled piano already utilized a few new SFZ opcodes that were submitted to René for review. Some of these were officially added to the specification, while others were still pending at the time René and Chad left Cakewalk. Simon Cann’s Cakewalk Synthesizers: from Presets to Power User 2nd Edition lists some of these new opcodes. Fours years have passed, but of course we didn’t stop there! We kept designing new opcodes (the so called ‘ARIA-extensions’), to keep the specification up to date with what other – newer – contemporary sample formats offered. Each time we did this, we asked ourselves: “What would René do?” How would HE transform a specific feature request into one or a series of opcodes in such a way that would both make sense, and wouldn’t break existing compatibility? This is not a trivial task for a single implementer to achieve. So we did our best not to ‘pollute’ the spec too much and we hope as time goes by to disclose as much info as possible on our extensions with the new forum and wiki on ariaengine.com. Today we present you Plogue sforzando, the new free, minimalistic SFZ 2.x player! It only has ONE instrument slot, no effects or mixers. 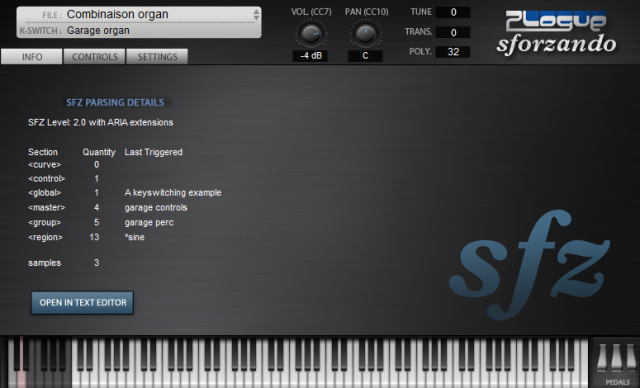 Just the ability to load SFZ files and to play sounds from current ARIA-based products. Of course we understand that editing text files to create sounds is not for everyone, but we’ve had too many requests for a product such as this not to pursue René’s tradition of giving away a simple player.